It's a Bear | Just Shooting Memories! By now, you are looking at this photo and thinking, what bear? Don’t look too hard, or maybe you should. It may be in the background. I owe my children a great big apology. 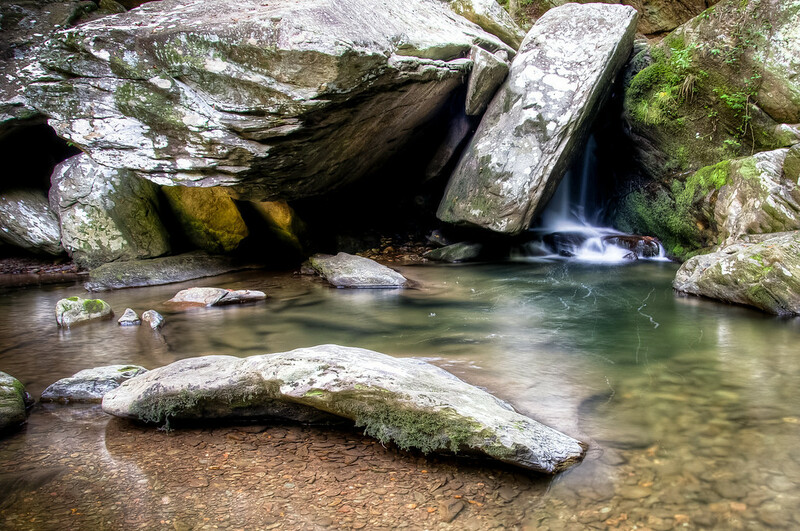 As you know, we went to Goforth Creek near the Ocoee River in Tennessee over the weekend. We were climbing the rocks through out the creek bed and while they were playing, I was taking photos. We got about 1/8th of a mile into our trek of about 2 miles total. Not very far from the parking area and the only major highway. I had just finished setting up for this shot when my oldest said “BEAR!” Of course, like most people, in the back of my head, I said “yeah right”. We were way too close to the road and along a well traveled part of the creek / trail. What did I do? Finish taking the shot and then on the off chance she actually did see something. I was thinking maybe dog or other small animal. I looked up and scanned my surroundings. Well, I was completely taken by surprise when I looked just above this waterfall and saw a full grown black bear. It was crossing the creek and heading to the right of the photo, where it began to climb the side of the mountain. About that time, daddy mode, as opposed to photographer mode, took over and I made sure to get the kids back out of the way. This resulted in me not getting any photos of the bear. So, to make the story even more interesting, I had done something very similar with my youngest several weeks ago when she found a snake. With the most sincerity, children, I am sorry!! !